At the beginning of World War II, most Australians still believed that their first loyalty outside Australia was to England. But by 1942, the fighting of a global war meant that even allies had to make hard choices. The British Prime Minister Winston Churchill made it clear that, if forced to choose, he would use English troops and equipment to defend England itself, rather than helping to protect Australia against the Japanese in the Pacific. The Australian Prime Minister John Curtin then called on America for help. Many older Australians who retained the traditional loyalty to England were shocked by this new allegiance. America responded, and from early 1942, thousands of American troops began arriving in Australia, preparing to fight the Pacific war. By 1943, there were 250,000 Americans stationed in Melbourne, Sydney and Brisbane. This was a time when very few Australians travelled overseas, and they got their ideas about Americans from the Hollywood movies which were extremely popular in Australia. Australians, especially the girls, are a bit amazed at the politeness of American soldiers. And they say that when an American gets on a friendly footing with an Australian family, he’s usually found in the kitchen, teaching the Mrs. how to make coffee, or washing the dishes. - Instructions for American Servicemen in Australia 1942. Special Service Division, Services of Supply, United States Army ; issued by War and Navy Departments Washington, D.C. 2007, Instructions for American servicemen in Australia 1942, Penguin, Camberwell, Vic. The main American military camp in Melbourne was Camp Pell, in Royal Park. Even though it was in the middle of the city, newspapers had to treat its location as a secret and only referred to it as being 'somewhere in Australia'. After the war, when accommodation was in short supply, the camp was used as public housing up until the 1950s. Official publicity and the media emphasised friendship and cooperation between Australians and Americans, but this was not the whole story. 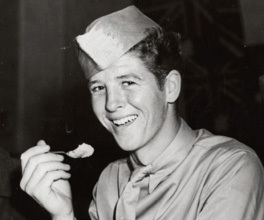 Despite the goodwill of most local people, tensions grew between some Australians and the American troops, especially when Australians saw local women going out with the ‘Yanks’. With their generous pay, the Americans could buy many things, especially alcohol, on the black market which Australian soldiers often had to go without. Sometimes these tensions erupted into open fighting. In Melbourne, on 13 February 1943, a major city street was completely blocked as an estimated crowd of 3500 American and Australian soldiers and local civilians fought an all-out brawl. Newspapers reporting the brawl referred only to ‘troops’ and suppressed the fact that it was Americans against Australians. Refugees escaping from Hitler found themselves caught up with captured enemy soldiers in Australia’s internment camps. Crete was a defeat for the Allied forces, but it was a fighting retreat, remembered with pride. Everyday life on the home front had to change when basic food items became hard to find.